In the mad rush of roasting, baking, searing, braising, and frying, sometimes we forget that there is another option: none of the above. This is a quick and easy no-cook dish that can accompany any meal, or stand on its own. The beans and peppers lend a fresh and crisp respite to a heavy entree, yet is hearty and filling if just served by itself. 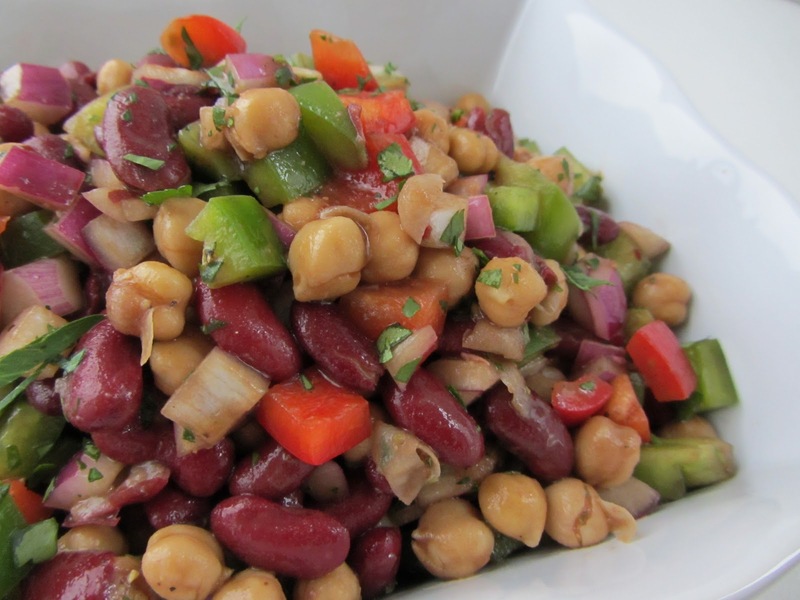 Even better yet, this salad tastes better if made ahead of time – allowing the beans to absorb and marinate in the dressing mellows the sharp vinegar taste, delivering a milder but more developed flavor. 1. Thoroughly rinse and drain the beans. Dice the onion and bell peppers so that they are about the same size as the beans. Finely chop the parsley. Place the beans, diced onions, peppers, and parsley into a large glass bowl, then set aside. 2. Make the vinaigrette dressing. In a small bowl, whisk together the vinegar, salt and pepper. Slowly stream in the oil, constantly whisking until the dressing is well emulsified. 3. Gently toss the dressing with the bean and bell peppers. * Use a glass or ceramic bowl when making foods with a vinegar component. Acidic ingredients can react with metal bowls, which can cause changes to flavors.